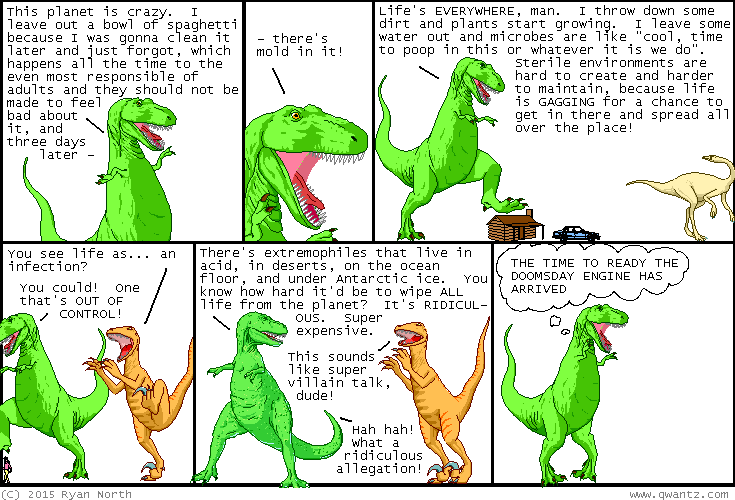 Dinosaur Comics - September 11th, 2015 - awesome fun times! September 11th, 2015: Are there any super villains who want to kill ALL life, not just the parts that look like them? I know Batman's frienemy Ra's al Ghul wants to destroy HUMANS but leave like, all the dogs and cats still running around. If he sold his plan not as "EVERYBODY DIES" but as "WELCOME... TO PLANET PUPPY" he honestly might get more support for it?? One year ago today: alexander graham bell spoke into his phone for the zillionth time, but this time it finally worked. we're lucky the first words on the phone weren't "okay try it now. can you hear me? can you hear me? aw damn it watson"